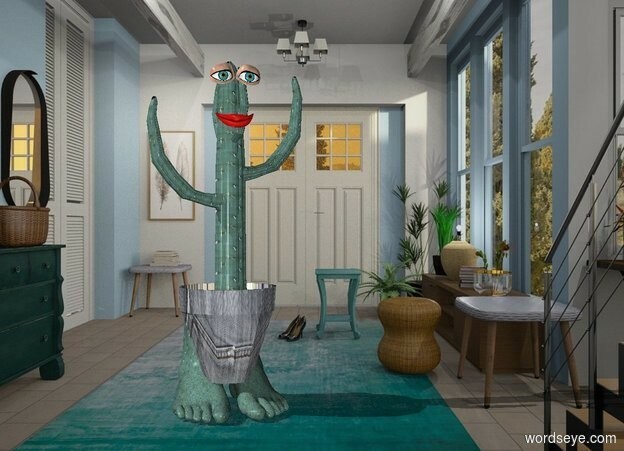 Input text: A [cactus] cactus is in a huge [denim] pot. Room backdrop. Two huge eyes are -1 foot above and -1 inch in front of the cactus. A huge mouth is -2 foot above the eyes. A huge [cactus] foot is -1.5 foot left of and -4 feet above the pot. A huge [cactus] foot is -1.5 foot right of and -4 feet above the pot.